Pidhirtsi Castle leaves vivid memories in everyone who visits this building of historical interest; it used to be deservedly called «the Versailles of Podolia». Once magnificent, its facade got grey long time ago because of the passing of time and experiences. Located in Pidhirtsi, the stronghold presents a majestic design of Renaissance palace architecture, organically completed with defensive structures such as bastions. The stronghold in Pidhirtsi had an opportunity to experience both a golden era, when lavish parties with prominent noble figures and European monarchs had taken place behind its walls and a period of oblivion, when this wonderful building had been many times on the verge of collapse. 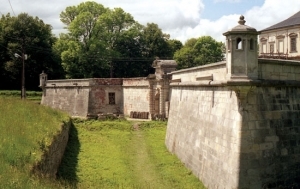 Today Pidhirtsi Stronghold is part of a popular tourist route called «the Golden Horseshoe of Lviv Land». Restoration work is still being carried out behind its walls. The first fortifications in the form of watch posts and defensive structures had already existed in the area where today's castle stands when Ruthenian tribes inhabited that land. A note about the settlement of Plisnesk, located only several kilometres from today's castle, appears in chronicles from the 12th century. However, a Mongolian-Tatar invasion in the second half of the 14th century, and next an expansion of Polish-Lithuanian and Hungarian rulers at the beginning of the 15th century led to a decline of the settlement. A charter by Polish King Władysław of Varna, dated from 1440, saying that the villages of Pidhirtsi and Zahirtsi belong to Janusz Podhorecki, is considered the first written note about the village of Pidhirtsi. 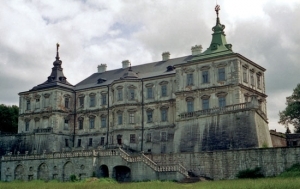 Unfortunately, the unique interior of Pidhirtsi Castle was lost forever in the whirl of difficult times in the 20th century. That is why today's tourists cannot enjoy the following beautiful rooms: the Chinese Room, Golden Room, Knightly Room, Mosaic Room, and Mirror Room. Some precious items from the castle's collection of that time are kept in the Lviv Arts Gallery and there is hope that when the renovation ends, some of the castle's rooms will charm with their beauty again. Currently you can admire the castle's appearance outside, with its interesting facade, terraces and stairs running to the loggia. Visitors can enjoy the appearance of the castle's courtyard with an old well behind it that once provided the entire castle with water; they can see an exhibition of old photographs located in the castle's casemates or go down to the castle's vaults, where today an exhibition dedicated to White Lady, the legendary castle's ghost, is held. 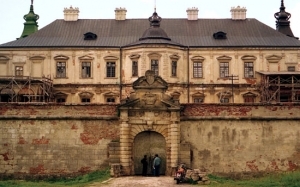 The Pidhirtsi Castle complex also includes a church and an Inn built in the 18th century in the time of Wacław Rzewuski. The Inn is located in the area of a former French park. It is a one-storey Baroque building that once was inhabited by servants of famous castle's guests or ordinary travellers. On the south facade of the Inn you can spot an old sundial that decorates the upper part of the building. The design of the Church of the Exaltation is interesting. An old lime-tree alley runs from the castle to the church. This wonderful church was made by an Italian architect based on the design of the Basilica of Superga in Turin.